Not every company’s Chief Customer Officer has the same scope. For example at DoubleDutch, Chief Customer Officer Annie Tsai manages both the customer service and account management. 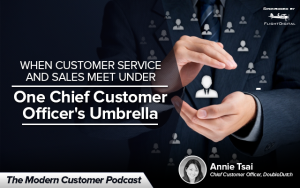 In this podcast Chief Customer Officer Annie Tsai talks about her secret sauce to leading customer engagement for a fast growth company with a unique stakeholder audience. She’s a powerful example of how to lead when you’re clientele is both B2B and B2C. On the Modern Customer Podcast she talks about how brands are making an effort to engage with customers via social media, and how DoubleDutch is adding a personal touch to community engagement (for not just B2B clients). We also took some time on the show to talk about Annie’s life outside of work. She shares with the audience what “a day in the life” is like for her. She opens up to talk more about what it’s like to have an exciting and demanding career and a young child at home. Annie is passionate about mentoring others and has solid advice on not only customer engagement but career advice for newbies to customer engagement. Anyone new to the customer engagement world won’t want to miss Annie’s words of wisdom. Annie is a customer experience focused executive with a “jack of all trades” mentality. She’s known as a balanced strategic and operational leader that loves to roll up her sleeves and get down to business. She’s also a published author and industry speaker. Prior to DoubleDutch she was Chief Customer Officer at Demandforce, an Intuit company where she oversaw customer success during DemandForce’s fastest period of growth. While at Demandforce, Annie transformed the way their customers used technology and social tools, building trust and community around the Demandforce product. At DoubleDutch, she spearheads a similar paradigm shift, increasing not only application adoption and utilization, but event return on investment for customers as well. DoubleDutch provides mobile applications and performance analytics for events, conferences, and trade shows for more than 1,000 customers including SAP, UBM, and Urban Land Institute. Founded in 2011, DoubleDutch was recently named to Inc. 5000’s list of fastest growing private companies, AlwaysOn’s Global 250 best-of-breed private companies in SaaS and Enterprise, and Forbes’ list of 10 hot companies to work for in San Francisco. DoubleDutch is based in the Mission District of San Francisco with regional offices in Amsterdam, London, Hong Kong, and Portland. DoubleDutch has raised almost 80 million dollars since its inception in 2011.